Subaru Forester comes in third in the best compact SUV fuel mileage comparison. See who ranks number one in real-world testing. What compact SUVs have the best fuel mileage? There are quite a few choices for consumers looking to save money at the pump and still drive an SUV. The Subaru Forester was recently tested by cars.com in a real world test to see who is the best. Forester has an EPA fuel mileage estimate of 26/33 city/highway mpg and 29 combined mpg. How does it stack up against the competition in real-world testing? The newly-redesigned 2019 Subaru Forester gets a new 2.5-liter boxer engine with direct injection, higher compression, along with the active valve control system. The new engine gets an increase in power and now produces 182 hp and 176 lb-ft of torque, versus 170 hp and 174 lb-ft in the previous-generation Forester. EPA estimates crept up one mpg improvement highway and combined over the previous generation model. Cars tested the Forester against a field of compact SUVs that included the Honda CR-V, Hyundai Tucson, Jeep Cherokee, Nissan Rogue, Toyota RAV4 and Volkswagen Tiguan. Their testing included a fuel economy drive where they took the SUVs on a 200+ mile route consisting of suburban streets, interstates and country roads to simulate a weekend road trip. How did the new Forester do in the real world? 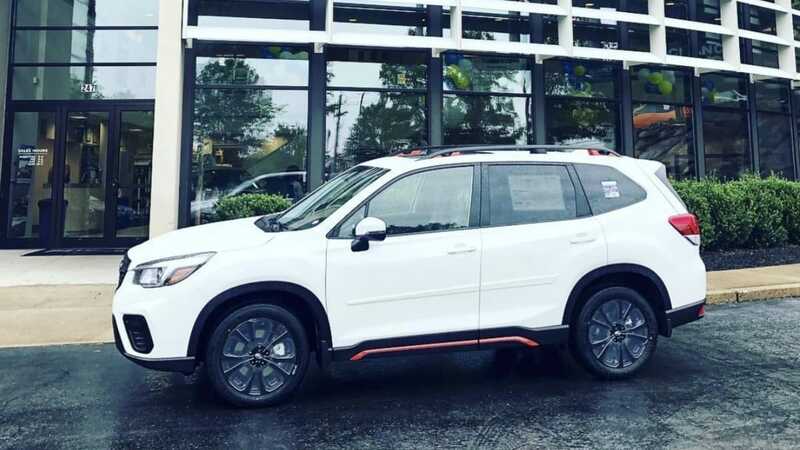 The all-new 2019 Forester came in third place. The tests revealed the Toyota RAV4 came in number one with a fuel mileage rating of 29.0 mpg. The Honda CR-V was number two at 28.5 mpg and Forester third at 27.9 mpg average for the 200-mile trip. The remainder of the field has the Volkswagen Tiguan fourth with 26.5 mpg, Jeep Cherokee 26.1 mpg, Hyundai Tucson 25.7 mpg, and Nissan Rogue 25.7 mpg. All vehicles use regular unleaded fuel. 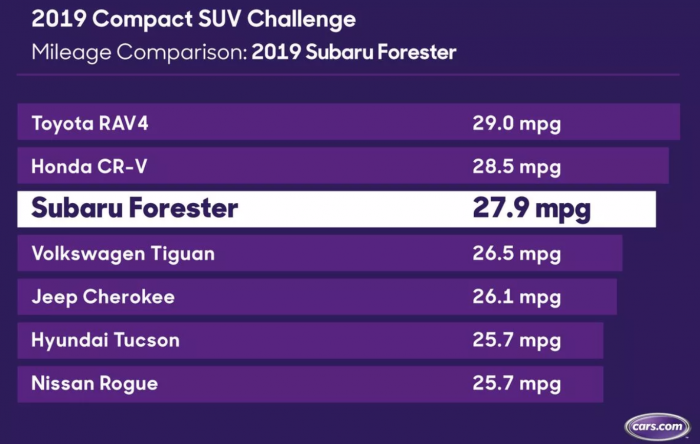 While 27.9 mpg on a road trip is good for a small SUV, in this real-world testing the new 2019 Subaru Forester came in about one mpg less than the EPA’s combined 29 mpg rating and well below its 33 mpg highway rating. The Toyota RAV4 was also below its EPA rating of 27/34 city/highway mpg and 30 combined mpg and Honda CR-V was down as well with an EPA rated 25/31 mpg and 30 combined mpg. Perhaps I missed it in the article, but were all of these vehicles "full time all wheel drive" as is the Subaru? As others pointed out, this article is useless without knowing if all were AWD. My other observation is that the government needs to crack down on the advertised MPG. Manufacturers need to submit and pay for independent testing that will determine the real MPG and the accuracy of their trip computers as I believe they are all made under unrealistic testing.